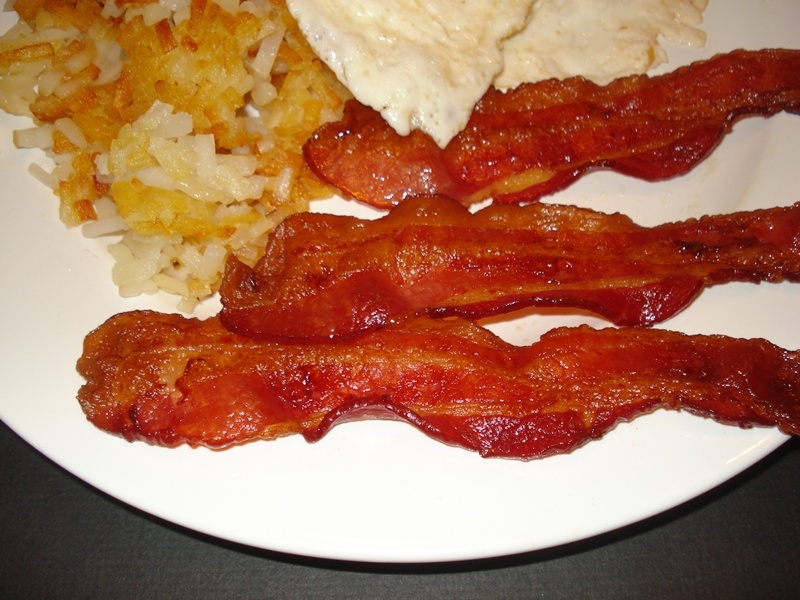 Baking bacon in the oven results in evenly cooked strips at the perfect point between crispy and chewy. It’s so much better than frying bacon in a skillet, which usually gets bacon with crispy middles and rubbery ends as the bacon starts to curl up. 1. Preheat oven to 400° (toaster or convection ovens work well). Line the oven tray or raised-edge cookie sheet with aluminum foil. Lay the bacon down on the foil, without overlapping the strips, or they’ll stick to each other. 2. Slide the bacon into the oven, and cook for 11 to 13 minutes. 3. Remove the tray or sheet from the oven, turn the bacon strips over, and cook another 2 to 4 minutes. 4. 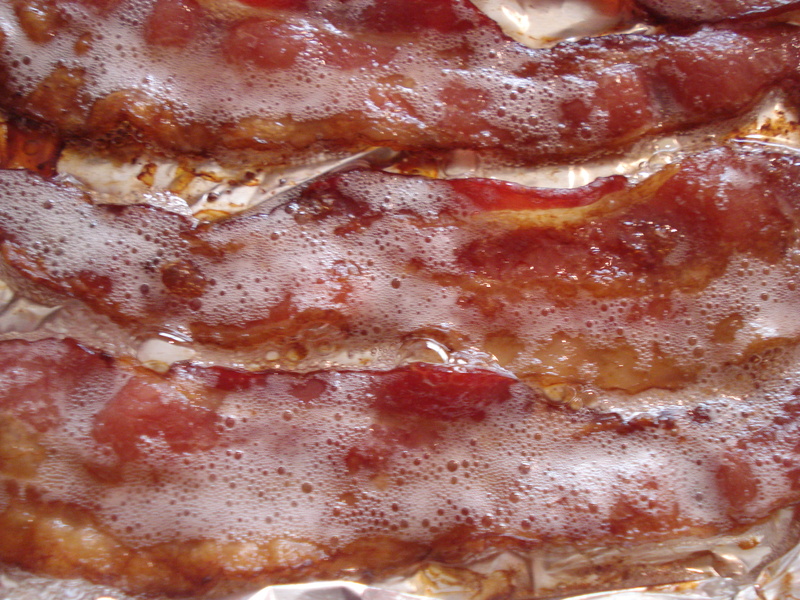 When the bacon is cooked, you’ll see bubbles and foam all around the bacon. If the bacon is thick-cut, it may take more time. Remove the tray from the oven, flip the bacon, and cook it some more, checking it every minute to see if it’s to your liking. When it bubbles, it’s almost ready. Near the end of the baking, the side of the bacon that is touching the pan will be more cooked than the side facing up. If you cook five or less pieces of bacon, it may take 1 minute less per side. Tommy Style: We used to tease our brother-in-law Tommy, because he like his bacon so very well done. Then one day we forgot to take the bacon out of the oven after turning the oven off, and Tommy was delighted with the results. Meilin and I tried it, and liked it. Instructions: Cook bacon as instructed, turn off the oven, and leave the bacon in the oven. After 15 or 20 minutes the bacon will be extremely well cooked, but not burnt, and will crumble easily for bacon bits.